In 2010, the Japanese Research Institute for Telecommunications ATR presented to the world the robot M3-synchy production of company Vstone. 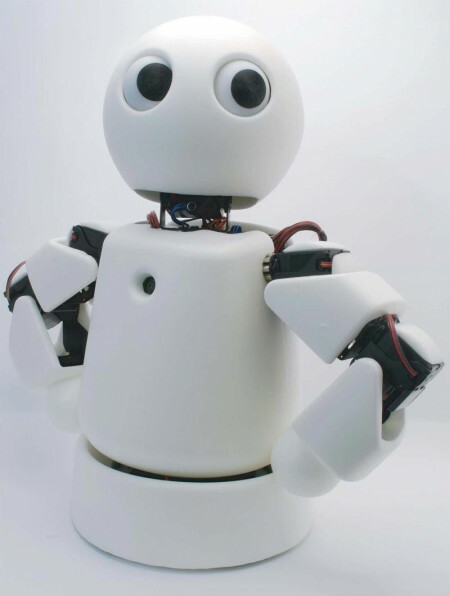 Compact robot is endowed with possibilities to recognize images and voice. Without removing from sales model M3-synchy, Vstone company started taking orders for a more advanced model,which called RPC-S1. Novelty has the following specifications: height 30 cm, 17 degrees of freedom, an integrated computer PICO 820, a camera of 1.3 megapixels, two microphones and a speaker. The only difference between RPC-S1 can be considered reduced in size, less detailed head and hands covered with foam rubber. The robot body is covered with the same material. Feature of the robot’s RPC-S1 is the ability to rotate his eyes, regardless of head movement, which allows to focus on an object.